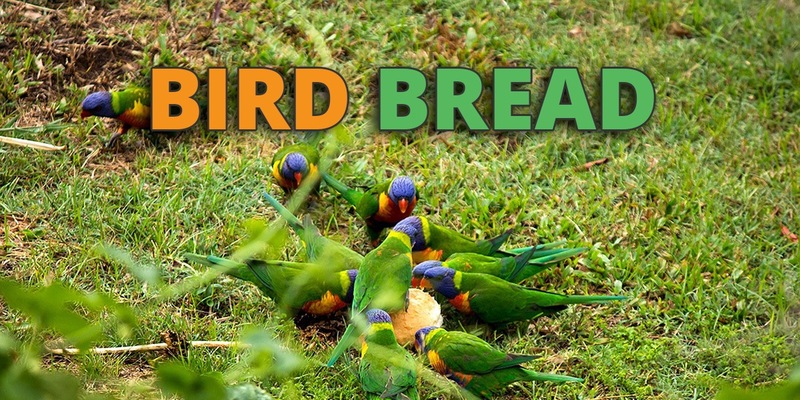 Making bird bread and baking for your pet bird also gives you the opportunity to introduce new foods or supplements to their diet in an unobtrusive way. Birds can be extremely picky eaters. It may be very difficult to get a parrot to change its eating habits, especially in birds that have been fed primarily seeds. You can bake some tasty treats for your avian companions and incorporate some much-needed nutrition at the same time. Why Bake For Your Parrot? Birds that end up in a rescue were often fed an inadequate diet of seeds. 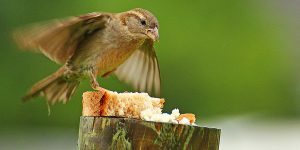 According to floridaparrotrescue.com, bird bread can be instrumental in helping to transition these birds to a more nutritious diet. If you have adopted a parrot that was in this situation and are having trouble changing its eating habits, bird bread might be the answer. Parrots are intelligent and inquisitive creatures that in their natural environments would spend a good part of the day foraging for food. In addition to the immediate benefit of eliminating their hunger, this foraging activity is also a form of mental stimulation and can be replicated with captive birds using foraging toys. Searching your surroundings and deciding what might be good to eat is definitely a cognitive challenge, one that a wild parrot engages in constantly. When we keep captive parrots and provide them with a proper diet we often remove the opportunity for the bird to exhibit foraging behavior. Food is readily available without the need to seek it out. This reduces the amount of physical and mental exercise that the parrot receives and can negatively impact their overall health. The bird can become bored with even its favorite foods when presented with them in the same manner day after day. Make sure you never use these ingredients or do these things when baking for your parrot. Don’t bake with the parrot around! Your bird should never be in the kitchen while you are cooking, especially if it is out of its cage. The potential for a dangerous accident is too great. Even in the cage, the inadvertent exposure to fumes is a risk you should not take. Deliver the baked goods when the cooking is complete. Don’t use Teflon Non Stick Cookware This is highly toxic to your birds and can kill them within minutes. See our full guide to bird safe cookware here. Avoid using ingredients that might be toxic to your bird. According to plannedparrothood.com, these foods are toxic to parrots: chocolate, cocoa, dill, apple seeds, rhubarb leaves, raw beans, cabbage, eggplant, onions, asparagus, honey, avocados, and cessia cinnamon quills. Alcohol and caffeine also need to be avoided. Don’t serve your bird hot food. Err on the side of safety and let it cool off thoroughly. Their crops are very delicate and can be easily burned. Here are some recipes to help you begin baking for parrots. Experimentation is strongly encouraged as you take these as a starting point for creations that satisfy your particular parrots. Just remember the safety points above and let your imagination and your bird’s appetite lead the way. Here are two recipes found at parrotparrot.com. Grease an 8″ pan with Pam. Mix dry ingredients. Wash eggs then pulverize in a blender. Mix in oil and buttermilk, then mix in dry ingredients. Bake for 30 minutes at 350 degrees. Cool and cut into small squares and freeze. Here is another recipe from wideopenpets.com. 2 cups chopped vegetables: use a mixture of different varieties, like broccoli, carrots, cauliflower, peas, and peppers. Many birds love hot peppers, the spicier, the better. Birds who usually avoid all vegetables will go crazy for a ghost pepper. There are a couple of issues that can be addressed when you bake for your pet birds. The most important is in making sure that your bird gets the proper nutrition it needs to avoid the health issues that captive birds can be prone to experiencing. Vitamin deficiencies, Fatty Liver Disease, and obesity are all potential problems with pet birds. A side benefit of your baking may be seen in a reduction in cleaning chores that are associated with your bird. Many pet bird owners feed their avian companions an inadequate diet simply out of ignorance. Pet stores sell bird “starter kits” that often contain a seed mixture that your bird certainly will like. Unfortunately, this does not mean it is healthy for your pet. Once the owner is apprised of their error, the bird may be so accustomed to its seed-based diet that it is very hard to interest it in more healthy food. 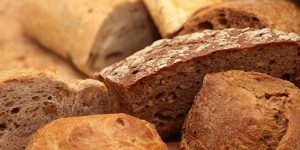 By finding a bird bread recipe that your bird likes, you can introduce various nutritious ingredients gradually, without your bird noticing. Vegetables and fruits can be finely chopped or pureed and worked into the bread’s batter, giving your parrot some much-needed nutrition wrapped in a tasty treat. If you want a list of additional food your parrot can eat, check out our guide: What do parrots eat? We hope these ideas give you some inspiration to start baking for your parrots or other pet birds. Below is a video showing bird bread made from scratch. Baking bird bread can be an enriching experience for you both, and will certainly help you get your stubborn birds to eat more healthily.